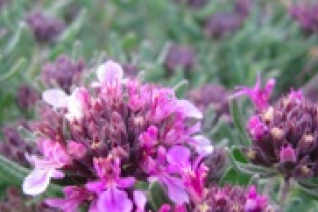 A small spreading rock garden perennial germander that we love for its profuse and long display of purple flowers over soft gray foliage. The small leaves have a fruity smell when pinched on this dome shaped spreading plant. To just inches high a single plant will expand to more than a foot square in a season. A plant for very well drained sites in full hot sun. Or a ground cover where soil is light, aerated with plenty of double digging and never becomes compacted. Where is that? Steep slopes and rock gardens where this plant excels. Avoid soggy winter conditions and site in the hottest place possible. Blooms appear from May to August. Little to no summer water once established. Grows on the steepest sites you can imagine. Nice plant for troughs, well drained containers. Do not cut back. Evergreen. 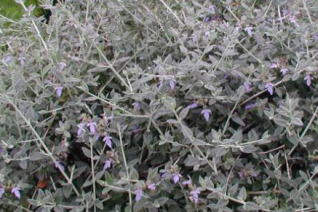 Silver Germander is a wiry shrub with gray foliage and even lighter gray/white stems. All summer it bears pale blue small flowers with a prominent central lip. Traditionally used in topiary or as a trimmed hedge, it takes amazingly well to heavy shearing. It responds by becoming incredibly dense. Its malleability leads people to also trim it into any whimsical shape they can dream of. Full sun, average, well drained soil. Little to light summer water when established. Requires full sun and a hot position with protection from subfreezing wind. Classic mediterranean shrub. Grows as well at the cool coast as it does in the hot inland areas. To 4′ x 4′ if left unpruned.